The main street in Cumberland has changed somewhat since the inception of the town in the late 1800s, eczema when thousands of miners uprooted themselves, nurse from Britain primarily, to follow King Coal to the land of opportunity, Canada. Back then Cumberland was a boomtown and Courtenay’s population was dwarfed by that of the instant, industrial domain of Robert Dunsmuir—a miner who became a millionaire. One feature of the Cumberland landscape that time hasn’t changed is the front of Frelone’s Grocery Store on Dunsmuir Avenue. It still retains the carved name in the stone lintel above the door, although the exotic turquoise paint is a recent innovation. The original grocery store was built in 1935 by Louis Frelone, whose family ran the modest shop for many years. 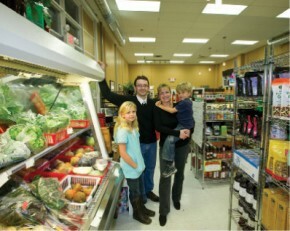 The next owners, Leo and Barbara LeBlanc, continued it as a grocery store until 1981. After that, Frelone’s Grocery had a variety of incarnations, including a motorcycle shop and a health food store. In the more recent past, it has been a weekend entertainment venue and an accountant’s office. Turner confesses to not knowing anything about running a movie house at the time she had the initial idea. “I just thought the Comox Valley would support another movie venue, The Rialto being the lone movie house now, when there used to be three cinemas. It also seemed to me it would be a creative and satisfying thing to do. What followed was a huge learning curve for Turner, as well as lots of ‘sweat equity’. She took advantage of a program offered by Community Futures, which provides a three week business course for those eligible under the Employment Insurance umbrella. Participants have to present their business proposal, which if accepted, leads to basic living expenses being paid for 10 months. During this time, the business has to become self-supporting. Not an easy task, as statistics show that most businesses take a five year period to show a profit. With the idea and plan in plan, Turner set to with a will. She bought a huge piece of canvas and experimented painting it with strips of shades from white to dark grey, then showing film on top of it. She discovered the light grey shade brought out the color and contrast of the DVDs to their best. “I laid the canvas down on the floor and ran around with bare feet and a long roller and put about seven coats of paint down. It was quite the project!” That canvas was then pinned to the front wall of Frelone’s, in front of the bay window, where it takes up the whole wall. DVDs can be formatted to fit onto the canvas, which is actually slightly bigger than a typical film screen. The next task was finding seats for the theatre—35 of them. “I felt a bit daunted to begin with. New theatre seats costs a fortune, and likewise old re-vamped seats. I had a limited amount of savings to spend, and was in a bit of a quandary. Then I thought of the wonderful old Palace Theatre, which was closed for renovations a couple of years ago, and the roof was set on fire accidentally. The water damage was such that the owners decided to demolish the whole place. That old time elegance is an important part of her vision for Reel Films. “People have used movies as a means of escape since their inception,” she says. “During the Depression, in the ’30s, movies were never more popular. Of course, it was a new technology then, plus there wasn’t the option of sitting in the seclusion of one’s own home to watch a movie. At the time Turner was applying for funding she took part in the annual World Community Film Festival, whose goals are similar to Turner’s. They want to educate and inspire people to become more politically active, in whatever way they chose. “At the time, I was still slightly unsure if I was doing the right thing,” says Turner. “I like to do things I’m good at, and this was uncharted territory, but being there, seeing those films that would never be available in Courtenay without a group to research alternative films, have the contacts with other communities that have already been presenting Film Festivals, and then obtain those films that are definitely not in the mainstream, really inspired me. Sensing how important it was to other people to share those experiences, have that new information about an event or an occurrence that otherwise we wouldn’t have had knowledge of, convinced me. Turner rolls her eyes and pulls a face at the memory, and adds, “Of course, I used it once and now it sits there taking up space!” Despite the heat, the opening of Reel Films was well supported by Turner’s friends, family and movie fans who turned out to watch Cinema Paradiso, an aptly chosen first film, as its subject is a boy whose dad runs a movie house. Despite the headaches of maintaining an old building—“The electrics are most unusual and needed some looking at”—plus the new reality of going from being a highly-paid seasonal worker to running a cinema that sometimes has five people, sometimes a full house, Turner is relishing her new endeavor. She has developed her own recipe for home-popped popcorn and makes cookies and other treats for movie-goers. So delicious is her popcorn that many locals call in only for that! One Cumberland resident came into Frelone’s and said that he’d already seen the current film and his pregnant wife had asked him to come for Turner’s popcorn, which she was craving. Delicious home-made goodies and movies chosen with intent sounds like a winning combination for Frelone’s latest makeover. To find out what’s showing, log on to reelfilmsatfrelones.com or phone 250-336-0190. Documentaries show on Thursday, general films Friday and Saturday and family movies on Sunday afternoons. These days it’s quite possible to go out grocery shopping and for very few dollars you can score yourself a fresh-from-Hawaii pineapple that tastes like it just recently left a Maui plantation. Angeline Street has no problem with our ability to do that, and she confesses that there are times she has a hankering for out-of-season strawberries and will make that purchase, knowing the strawberries didn’t originate here. At the same time the philosophy and marketing belief she shares with her husband and business partner James is to encourage a local and healthful connection for your grocery marketing wants and needs. The bonus is, the Streets provide access to localized shopping. That’s partially what Brambles Market is all about, though it’s also more than that. The ‘more’ part is for us, the consuming public, to be able to explore the wonders of our foodstuffs, their purchase and how much better the eating and family feeding experiences can be with a shift in long-held attitudes about convenience and access. “Our mandate is it has to taste good, it has to support the economy, and it has to help the producers make a living,” says Angeline. Brambles Market has just celebrated a year in business at its site in Downtown Courtenay, on 4th Street across from the Courtenay Museum. Situated in a highly popular spot that boasts a rather European town square ambience—what with a popular coffee bar and café with its extensive patio, as well as a gelato purveyor—Brambles effectively completes the picture. “We saw a need,” Angeline says quite simply of their inspiration for bringing Brambles into being. With her long background in retail, and James’ training as a chef, food purveying seemed like a natural. That, combined with their beliefs, was the guiding force behind their move into the former Island Inkjet site. The other belief revolves around buying locally whenever possible, followed by items from elsewhere on Vancouver Island, and ultimately from the rest of the province. She notes they had arrived at this local purchasing conclusion well before the now widely-embraced 100-mile-diet came into vogue. At the same time, the renewed boost by the 100-mile philosophy was welcomed because it both raised public awareness and gave a nice boost to business. It was a good bit of synchronicity, Angeline says. She notes that various fruits like bananas and oranges obviously don’t grow here. Likewise, if you are fond of rice and rice dishes, it has to be imported. But, at the same time, people will automatically buy a certain brand of, say, flour, and be understandably oblivious to the fact that there is flour available—carried by Brambles—that is grown and milled on Vancouver Island. “Part of our role is to provide access not just to the obvious items like fresh produce, but also to brands packaged on Vancouver Island,” she says. While the current store is fine for their needs at the moment, Angeline says they would ultimately like to be bigger. One of the motivations they wanted to satisfy with Brambles, she says, was to recognize that, as affectionately regarded as the Farmers’ Market is amongst Valley residents, it has its limitations. There were gaps. Brambles was designed to fill in those gaps. As far as competition goes, the opening of Brambles begs the question as to whether Edible Island doesn’t have that market sewn up locally. Angeline says their direct competition isn’t actually Edible Island, but the Courtenay Thrifty Foods store. In that context, she says, any chain supermarket gets a huge customer base because of not only the vast array of products available, but also due to shopper habits. It is those habits that Brambles wants to change. And thus far they are succeeding nicely. Human beings are creatures of habit, Angeline asserts, and contemporary householders are busy. When they shop they think of it not as an experience for the most part, but a task to get over and done with. Brambles’ produce all comes from organic growers, and local growers as much as possible in season. Meanwhile, none of their meat has been adulterated with steroids or antibiotics. Another area of motivation, adds James, is respect for local farmers and producers. He is quick to assert that the agricultural community of the Comox Valley—one that is much more extensive than many residents realize—is a significant part of his heritage. “My grandmother was a Piercy and they were among the pioneering farmers of the Comox Valley,” he says. “I want the Comox Valley to respect and preserve what we have here, and one way we can do this is to buy their products. As they have to compete with the big chain stores, and that can be a daunting objective, it is essential that Brambles offers alternatives in order to retain and also expand its customer base. James believes that their meat offerings cannot help but entice those who are seeking unadulterated quality. Their sausages, for example, contain no binders or fillers. That puts them well ahead of most commercial sausage brands which can actually contain such fillers as silicone dioxide—or sand, in other words. Likewise many commercial chickens are injected with water, and the law permits up to 30 per cent water. Brambles’ chickens are 100 per cent actual chicken. In one respect what Angeline and James are offering at Brambles is nothing new. This was the way marketing was carried out by everybody a few decades ago before chain stores established themselves and offered the conveniences they do. At the same time, what Brambles is offering isn’t retro either. That’s because all that is available must meet the scrupulous standards of the proprietors, as well as meeting stringent provincial codes. That wasn’t always the case in grandma’s day, not to mention the fact that marketing regulations were virtually nonexistent in days of yore. So, what is this customer base that is seeking ground beef with which you can actually barbecue a hamburger and know the meat was just ground that day, on site, and finds its source in a single side of beef from a steer raised in the Comox Valley rather than perhaps multiple heads of cattle, slaughtered elsewhere with how long ago being anyone’s guess? While you might think that the bulk of Brambles’ trade would originate locally—and they assuredly have an ever-growing Comox Valley customer base—Angeline has also found it interesting how much the store appeals to newcomers, and especially those from larger centres like Vancouver and Calgary. That the Streets convey a combination of gratitude and support for their community goes without saying. In the same context they are strong advocates for other localized businesses and believe that the public should give them all the support they can for fear of otherwise losing them. In that sentiment they cite the case of the speculation around a large international chain restaurant considering setting up shop in the Comox Valley. She notes that to qualify as a BC product, the item must be at very least packaged in this province. As there is no olive crop grown here, when you buy olive oil you are obviously getting something that originated elsewhere. But, the olive oil can be bottled here—and some labels are—and hence becomes a BC product. At the end of the day, what it comes down to is education, the Streets say. It’s a matter of learning to appreciate what we’re eating both nutritionally and taste-wise. “Eating for good taste and good nutrition has a lot of potential once you get into the swing of it,” Angeline says. “Get into the habit of buying good food and preparing good and nutritious meals, and they can be done simply and quickly, you’ll never look back.